Screenplay: David Weisberg, Douglas Cook, Mark Rosner. Starring: Sean Connery, Nicolas Cage, Ed Harris, Michael Biehn, William Forsythe, David Morse, John Spencer, John C. McGinley, Tony Todd, Bokeem Woodbine, Danny Nucci, Claire Forlani, Todd Louiso. This film has a lot to answer for, mainly because Hollywood decided to give more jobs to director Michael Bay following this successful action film. Unfortunately, what he produced after this makes my eyes bleed but he has to be given credit for keeping up the thrills in this one. The story is (as ever) basic! A disgruntled veteran (Ed Harris) feels the government has done him wrong despite his service to the country and decides to hold the city of San Francisco to ransom by taking over Alcatraz and using it as a base to launch a chemical attack on it’s innocent citizens. The Government feels he’s a loon-ball and decides to enlist the help of F.B.I chemical weapons expert (Cage) and a team of marines to put a stop to the lunacy. None of them have have a clue how to infiltrate Alcatraz so persuade a former British agent (Connery) – the only person to ever escape Alcatraz and currently being held by the Americans – to help out and earn his freedom in return. What then ensues is…you guessed it…big guns, big explosions and mucho machismo. This is all done under the guidance of producer Jerry Bruckheimer, so I suppose you can’t really complain when things get silly and over the top. I’m not a great action fan but I can recognise it for what it is and this isn’t too bad, considering. 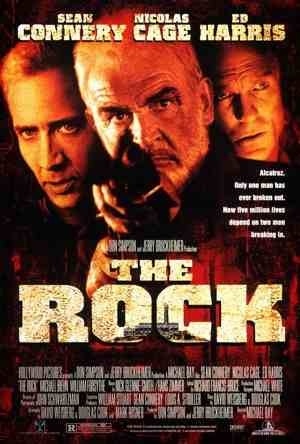 The three leads involved, Connery, Cage & Harris are what make this film. They are all fine actors and deliver worthy performances. 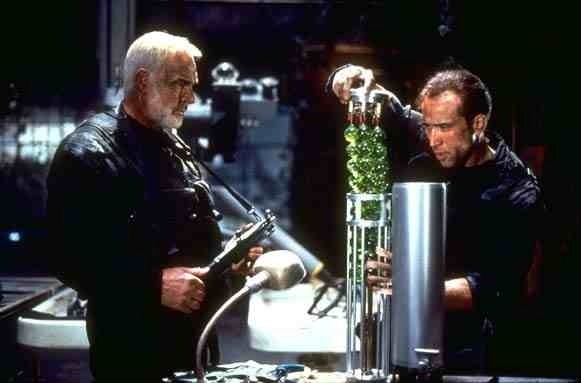 Connery is one of very few actors that can cut being old and still able to be convincing as an action hero (Clint Eastwood being a recognisable other). Cage shows his early action man credentials, while still retaining his wacky humorous side and Harris, as always, is intensely commanding. They all seem to have their tongues stuck firmly in their cheeks and in it for the healthy paychecks. They know and we know, that this is complete nonsense but hey, there’s fun to be had anyway. If you ever get the sudden notion to bang your head against a big Rock, don’t bother. Bang your head against this one instead. It almost has the same effect but this one’s slightly more gentle. Just slightly, mind you. This entry was posted on January 15, 2012 at 4:59 pm and is filed under Action with tags 1996. You can follow any responses to this entry through the RSS 2.0 feed. You can leave a response, or trackback from your own site.